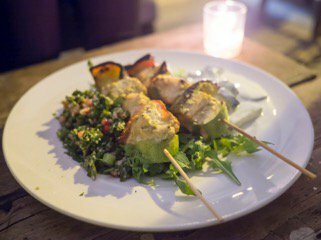 Damascus Chef is an independent restaurant in Hither Green, South East London. Drawing on the many threads of Syrian cuisine, Abdullah Alawayed, the Damascus Chef, stimulates the senses of vegans and carnivores alike. From the gluten lovers and the gluten free, to the light snackers and the heavy eaters among us, the Damascus Chef and his team prepare sensational foods with zest, passion and precision. Damascus Chef sources the freshest ingredients (grown and made at home where possible), all of which are halal and can be organic upon request. As well as popping up at the Good Hope cafe at PLACE Ladywell, Damascus Chef also offer catering classes and kitchen takeovers. The latter is perfectly suited to special dinners and occasions, where the Damscus Chef can cater for up to 20 people at a location of your choosing. Damscus Chef currently operates on a Friday night and is looking for a venue for a regular Saturday night too!